In Edmonton this weekend, our rhubarb out in the garden hasn't unfurled itself yet. Although at least it's not covered by snow. In Courtenay last weekend, my dad's rhubarb out in the garden was growing pink, squat stalks. It was definitely not covered by snow. So, of course, Dad sent us home with a bag of them – not to mention the kale and fresh herbs that were tucked around it. The next day at home in snowy Edmonton, I decided to try roasting the rhubarb. 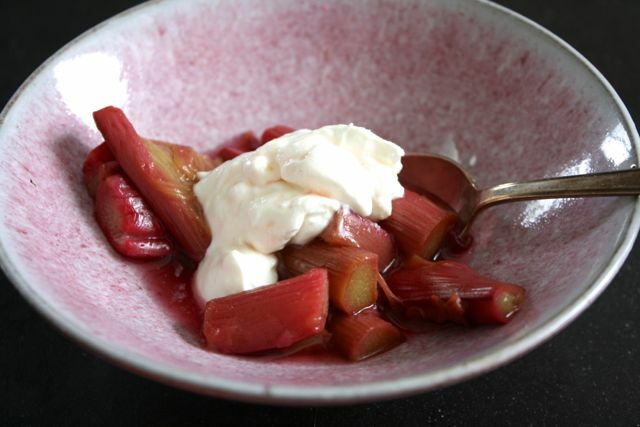 I followed Orangette's simple recipe with wine and vanilla, and soon had perfectly tender rhubarb that held its shape beautifully – if you were careful spooning it out. I added a little yogourt and some of the bright-pink syrup pooled in the bottom of the baking dish, and had a lovely birthday snack. 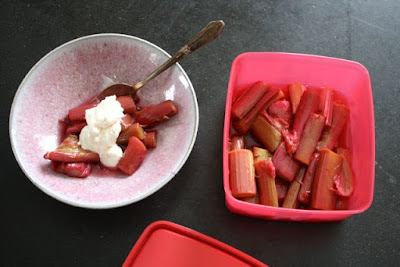 The wine and vanilla are just haunting flavours, not overpowering, which means the roasted rhubarb is also good with breakfast. Now that I've used all of my Courtenay supply, I'm anxiously watching mine in the garden here. When it does unfurl and shoot up, I'll be ready. Get out a heavy baking dish with high sides, such as a Dutch oven or Corningware casserole dish. Preheat the oven to 350 degrees Fahrenheit. In a medium bowl, toss the rhubarb with the wine, sugar and vanilla. Line the rhubarb up like soldiers in the baking dish and put in the oven. After 15 minutes, carefully stir the rhubarb so it all gets cooked. After 15 more minutes, check on the rhubarb. It should look intact but actually be tender and ready to eat. Serve with a bit of the syrup that's pooled in the bottom of the dish.